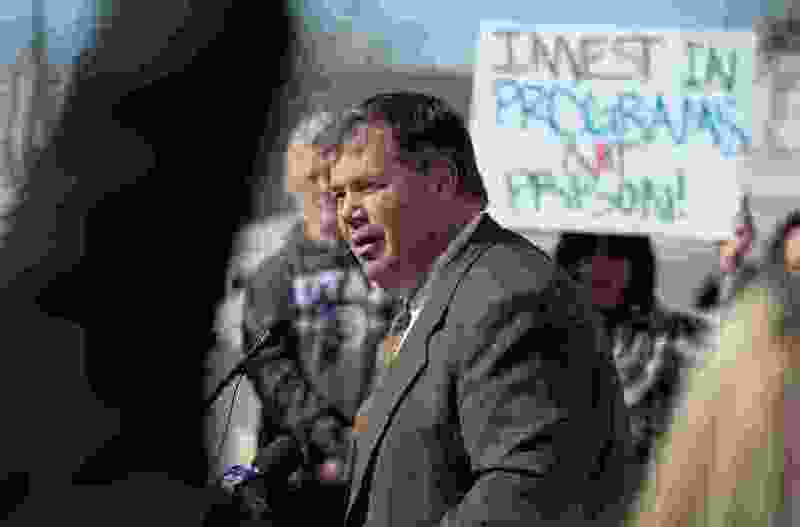 Francisco Kjolseth | The Salt Lake Tribune Rep. Eric Hutchings, R-Kearns, expresses plans for a bill to be revealed soon that addresses criminal justice reform, during a rally on the Utah Capitol steps on Monday, Feb. 10, 2015. President Donald Trump’s hard-line immigration stance has led to an increase in deportations for immigrants convicted of even minor crimes. And that may result in a change in how Utah punishes low-level offenders. Rep. Eric Hutchings, R-Kearns, plans to introduce a bill during the legislative session, which starts Monday, that would alter the maximum penalty for a class A misdemeanor, dropping it from one year to 364 days. This comes in response to a federal law that says a conviction that carries a penalty of a year or more in jail is considered an "aggravated felony” that can trigger deportation proceedings, even for those who entered the country legally. That law has been on the books for years but hasn’t been used much until Trump took office. Hutchings said that lowering the class A misdemeanor penalty by one day will help Utahns convicted of low-level crimes — marijuana possession, theft or criminal mischief, for example — avoid the risk of an automatic deportation. The idea for the bill originated with the Refugee Justice League, a group of over 700 attorneys who volunteer their time to help refugees who are discriminated against. Co-founder James McConkie said Hutchings' bill is the Utah-based organization’s first priority during this year’s legislative session. McConkie said the current conflict in the law is especially damaging to refugees, who can be automatically deported for crimes as simple as joyriding. This often removes a father from the home, he said, and leaves a family struggling to make ends meet. Or young people, he said, can be deported and separated from their families because of minor crimes. And when refugees are sent out of the country, McConkie said their lives are on the line because of how dangerous their home countries are. Carolina Núñez, an immigration law professor at Brigham Young University, said the federal guidelines were initially limited to a smaller number of violent crimes, but that has changed through the years. Núñez noted that it’s difficult for people to make an argument they should stay in the country when they have been convicted of what the federal government deems a “violent felony” — if they can even get a hearing before an immigration judge. The classification can also affect their ability to seek asylum and makes it so people can’t voluntarily leave the country without a deportation on their record, which could restrict their ability to return to the United States. States like California, Washington and Nevada have taken similar action in recent years to lower the maximum penalty for misdemeanor charges by one day. Others have avoided the penalty altogether because the maximum penalty for their misdemeanors is already less than a year. Hutchings’ proposal has the support of the Utah Sentencing Commission, according to Director Marshall Thompson. Some Utah prosecutors don’t like the bill. Ryan Robinson, president-elect of the Statewide Association of Prosecutors, said his organization worries the proposal downplays the seriousness of some misdemeanors. They’re concerned with crimes like sexual battery, stalking and repeat domestic violence offenders. “Some of our most alarming offenses are in that class A category,” he said. Robinson said if a defendant is “low-risk,” plea negotiations can be done so immigration consequences are avoided and someone isn’t punished too harshly. “I don’t see that there’s a problem that really needs fixing,” the prosecutor said. Hutchings said he doesn’t believe people in Utah are frequently being deported for class A misdemeanors alone. But he said lowering the penalty by just one day is the right thing to do for those who do get caught in that situation. Making the change, he said, falls in line with other criminal justice reform policies that Utah lawmakers have passed in recent years. Correction: Jan. 24, 3 p.m. • This story has been updated to correct the description of a federal law that allows a conviction leading to a sentence of a year or more in jail to trigger deportation proceedings.